Paperback, with flaps, 720 pages, 13.5 x 21.5 cm, 5.3 x 8.5 in. The Stauffenberg Mythos – A new biography based on rediscovered documents. On July 20, 1944, Claus Schenk Graf von Stauffenberg made an attempt on Hitler's life aimed at liberating Germany from its criminal dictator and put an end to World War Two. 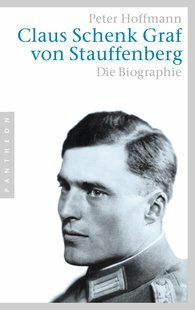 In his classic biography, historian Peter Hoffmann, one of the best authorities on the German resistance, draws a fascinating portrait of Stauffenberg, of his family milieu and his spiritual roots. He describes the difficult path taken by the officer, who for a long time felt bound to his oath of loyalty to Hitler before becoming a resistance fighter who saw the murder of Hitler as the only solution.